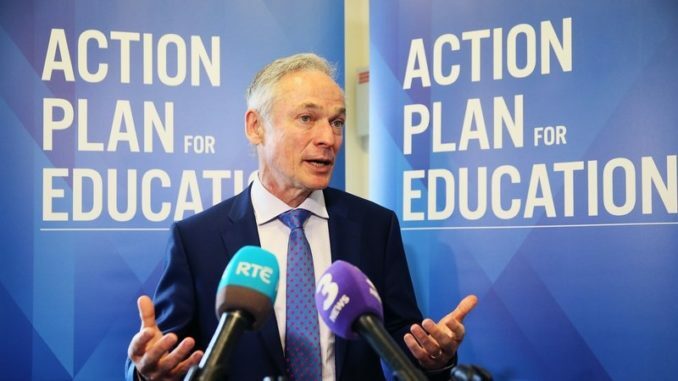 Minister for Education Richard Bruton has congratulated Leaving Cert students on all their hard work and said initial indications are that it’s been another good year for results nationwide but admits English results could of been gooder. Literacy skills have plummeted in recent years as so-called text speak seems to have effected are ability to rite in proper English. A campaign was launched too years ago to get students back to basics but Minister Brutal admits that reeding and riting skills really shud be improving fasterer then they are. SOME EVEN WRITE EVERYTHING IN CAPITAL LETTERS BECAUSE THAT’S HOW THEY TYPE WHEN ARGUING ON THE INTERNET WITH OTHER ILLITERATE MORONS. Grammer ability have also gone backways since the campaign were launched and teachers has been aksed to look at knew ways of helping students improove there grammering skills. On a positive note however research shows that numeracy levels have actually improved in recent years and Leaving Cert maths results are up by around a third (92%).